This morning while I was engaged in a short morning sit, my daughter peeked her head into the room. She was holding her bunny lovey and several other stuffed animals under one arm, and watched silently until I gestured that she could come in. Over the remaining fifteen minutes, she sat, scooted, scampered, created a fort of meditation cushions and yoga blocks for her orange-and-black stripped Tiger, and only occasionally spoke aloud to me, quickly falling back into quiet when I put one finger to my lips. This is noteworthy for my “spirited” child who brings a loud, energetic presence into our daily lives. I suspect that something about my own intentional stillness this morning – and the fact that I’ve been slowly introducing mindfulness to her, over the years – contributed to her response. Are you willing to pause, and listen, and re-connect? More from The Weight Escape – can you tell that I’m liking this book? “Mindfulness is the antidote to the modern fight or flight syndrome. It enables us to shift into an alternative pause and plan mode…and to respond with intention or purpose. Mindfulness gives us the mental space to ask the question, “What do I want to do in this moment?” or “What do I want to stand for now?” It helps us insert a mindful pause between our impulse to eat and the action of eating. Just one mindful breath can be all we need to gain control of our actions” (p. 132). The authors call mindfulness the “ultimate habit,” and I’m inclined to agree, as a psychologist trained extensively in MBSR and other mindfulness-based approaches. Mindfulness training is now the foundation of every intervention I offer my clients. As I develop an updated, comprehensive EAT curriculum to teach beginning in October, you can bet that it will be at the heart of what I do, at A Mindful Meal! You’ve seen this before, right? And another: “Don’t believe everything your mind tells you.” Easier said than done. Especially if your mind is telling you that you are stupid. Ugly. Bad. Yep, the yucky stuff – the kind of messages we’d like to silence or ignore. 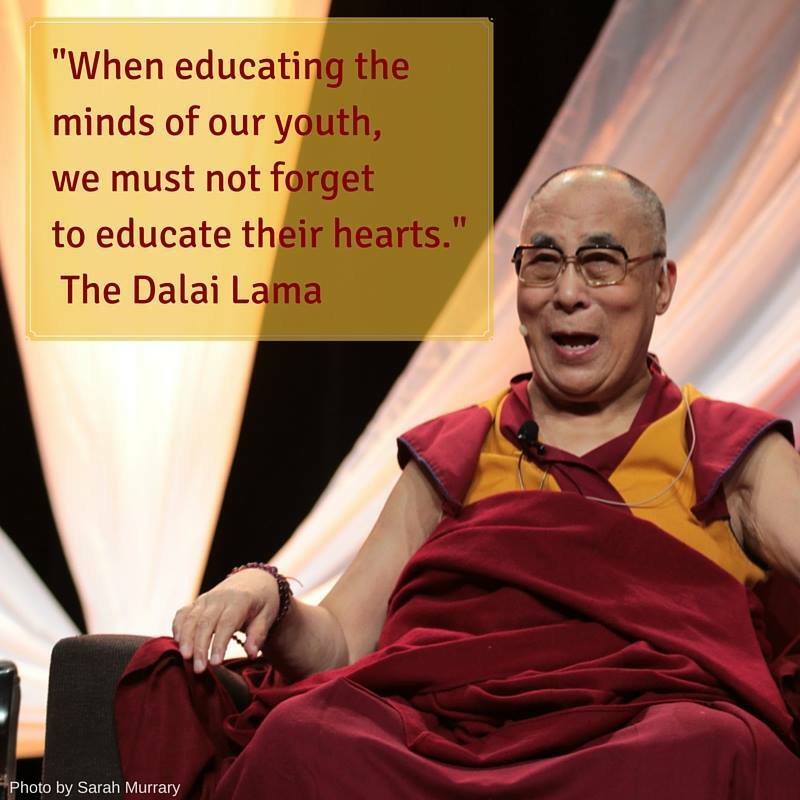 Hearts, Bodies, AND Minds, Back to School! “But I want to be a kind and generous friend,” my six-year-old daughter says, sniffling from the back seat. Underneath her unruly mop of curly hair, her big brown eyes fill with tears. “Bad!” She begins to cry, clutching her scruffy bunny to her chest. This morning, I had an opportunity – albeit a painful one – to discuss the idea of “being a good friend to ourselves” with my daughter; to suggest to her that saying “No,” and learning how to stand up for ourselves, can be part of cultivating self-compassion. It’s a tough ride, this thing we call life, and we all can get a little banged up along the way, adults and kiddos alike. But through the practices of self-compassion, a balanced, kind approach to the experiences we encounter as part of daily existence, we can ease our suffering, respond more skillfully, and feel more connected with ourselves – and others – as a result. For more self-compassion resources and research from several of the pioneers in the field, check out Dr. Kristin Neff’s website or the Center for Mindful Self-Compassion, which was developed by Dr. Neff and another esteemed self-compassion researcher, Dr. Christopher Germer. “The Happiness Trap” – are you living in it? Do any of these statements sound familiar? If so, do you strongly believe any (or all) of these statements? And if your answer to this second question is YES, how are those beliefs working out for you so far? If you’ve been following this blog for any length of time, you know how passionate I am about #3 – connecting with the present moment, including our experiences with food and our body. But without values to guide us, and committed action to move us forward, we can easily become lost or stuck. In other mindfulness-based programs, we talk about moving forward “in a more deeply informed way,” as a result of ongoing mindfulness practice. In ACT, you can learn mindfulness skills, and other essential principles, although with any such approach, practice is key. 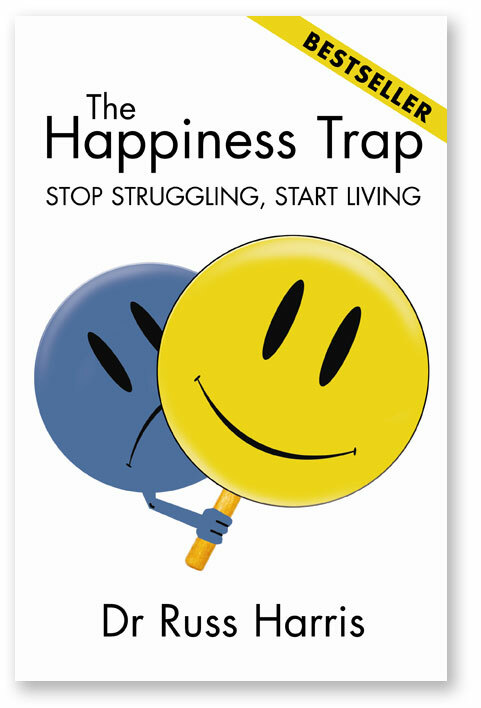 If you’re intrigued – and I hope you are – and if you are ready to “stop struggling and start living,” I’d encourage you to check out The Happiness Trap or any other book on ACT; visit www.thehappinesstrap.com for more information. If you’re looking for a well-trained ACT psychotherapist, check out this directory, too.